The enthusiasm for our LensWork community book projects is amazing! Each year, we have room for only fifty 6-image projects and quite a challenge selecting them from the thousands of entries! In this series of audio commentaries, Brooks discusses the aspects of each project that propelled it to the elite group to be published. 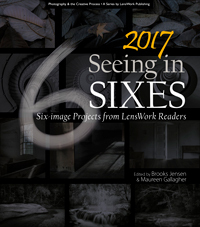 A great resource supplement for those who have the book and want to use it as a further learning tool for their own 6-image projects!